Minnesota’s Iron Range is actually made up of three distinct ranges: the Vermilion, the Mesabi, and the Cuyuna, and the work in all their mines was dirty and dangerous. Dynamite and nitroglycerin were used to break up ore; the blasting threw debris into the air, and the vibrations often created landslides at other points in the mine; underground mines could collapse. The mines claimed the lives of many workers. Early mining operations left behind no clear records, but some claimed that in 1889, two men a week died in the Vermilion Range’s Soudan Mine alone (others say no more than five that entire year). Between 1905 and 1910, more than seventy workers died in underground Iron Range mines each year. 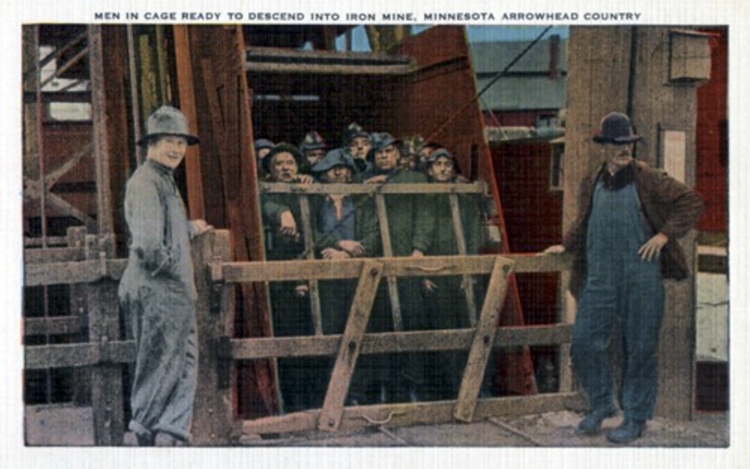 Perhaps the worst Iron Range tragedy occurred on February 5, 1924, at the Milford Mine near Crosby. A forty-eight man crew working a shaft near Foley Lake apparently struck an unknown underground stream, causing water and mud to flood the mine (some sources say it was the lake itself that broke through the mine). Seven men managed to climb a ladder up the side of a two-hundred-foot shaft; the other forty-one perished. The men who worked the mines were mostly immigrants from Norway, Finland, or Sweden, giving “Da Ranche” its decidedly Scandinavian flavor. Other miners came from Italy or Cornwall, England. The coal miners from England’s West Country brought their own vocabulary to the mines. They called their shift boss “captain,” downward mines weren’t dug but “sunk,” upward mining was “rising,” and digging a horizontal mine was known as “drifting.” In 1892 Vermilion underground miners worked 257 days a year and earned from $1.96 to $2.55 a day, actually a higher rate than miners were paid elsewhere. In today’s money, the higher-paid employees would be taking down about $265 a week before taxes.Those shift bosses the Cornish called “captain,” usually men who had a great deal of mining experience, held the authority of a ship’s captain; anyone not responding promptly to a captain’s orders could be immediately dismissed. To distinguish them, the captains wore a “somewhat formless hat, that resembled only slightly that of a ship’s captain.” Another Cornish tradition that became part of Iron Range life was the pasty (or pastie): beef, potatoes, rutabagas, and onions (often leftovers) wrapped in a pastry shell and baked; it was a hearty meal the miners could bring to work for their lunch break. Hundreds of mine pits dot Minnesota’s Iron Range. Hibbing’s Hull Rust Mine, the first strip mine on the Mesabi Range, was by far the largest. Actually made up of several mines—Mahoning, Webb, Agnew, Sellers and Buffalo-Susquehanna—the Hull Rust became known as the “Grand Canyon of the North” and produced a quarter of all the iron ore produced in the United States during the 1940s. The Mountain Iron Mine was the first Mesabi Range mine to produce ore, earning it the nickname “the birthplace of the Mesabi.” The very first mine on the Range to produce ore was the Vermilion Range’s Soudan Mine, which sent its first trainload of ore to Agate Bay the day before Independence Day, 1884. Twenty-five years later the Soudan had produced 8,202,900 tons of ore, about half of the 17,225,871 tons pulled from the ground at Mountain Iron.